Push-out-and-play jigsaw book. 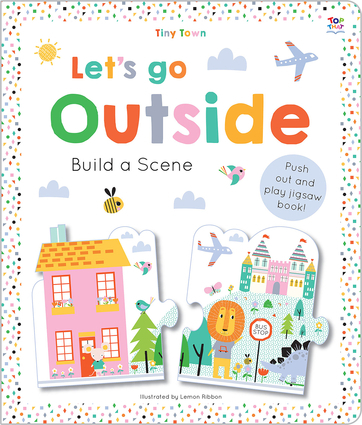 Visit Tiny Town with this giant-jigsaw storybook that's ideal for children age 3 and up. Each spread includes a big, easy-to-use jigsaw piece that pushes out to make a giant six-piece Tiny Town jigsaw. The rhyming text appeals to new and emerging readers, and the big jigsaw pieces are perfect for little hands! Joshua George writes both fiction and non-fiction for children and is the author of the successful Sticker History series. Joshua lives in rural Suffolk, England.Set up in 2009, Lemon Ribbon create little packages of imagination; unique, on-trend designs that children, parents and retailers love. From their studio in London, their team of talented designers produce prints and graphics that sell around the world. They are proud to have developed one of the world's best youth-focused design studios.